Clean The Bay, a Rhode Island-based non-profit environmental organization that specializes in removing large debris from the shoreline, is headed back to Connecticut. Clean The Bay crews are scheduled to clean areas of shoreline in the Mystic, Stonington and Little Narragansett Bay areas. 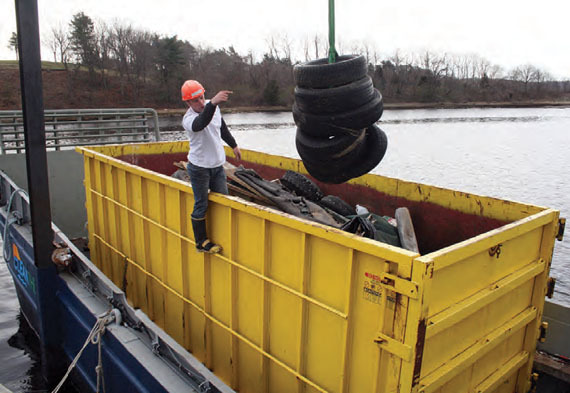 Equipped with a mechanized fleet of landing craft, a hard-working team of volunteers and an ambitious staff, Clean The Bay has removed thousands of tons of debris from Southern New England shorelines since its founding five years ago. In addition to its already impressive staff, Clean The Bay recently welcomed Newport maritime professional Capt. Kent Dresser onboard as its new Executive Director. Known best as the President and founder of Confident Captain/Ocean Pros in Newport, RI, Dresser has worked in the response towing and salvage industry on Rhode Island’s waters since he was 14 years old. He holds a bachelor’s degree in Marine Affairs from University of Rhode Island, and is excited to join the clean-up efforts in 2012, beginning with the current project in Connecticut. “I hope I can bring a level of energy and expertise to Clean The Bay that complements the hard work that Clean The Bay has done over the years to benefit everybody that uses and enjoys the coast,” said Dresser. “The shoreline has been in dire need of a professional team to remove debris from it for generations. We’re here.” Since 2005, Clean The Bay has removed 1,470 tons of debris from Rhode Island shorelines. The mission of Clean The Bay is “to persistently remove marine debris in order to improve and preserve our nation’s coastlines and waterways.” The organization works with local, state and federal regulating agencies, elected officials, businesses and shoreline residents to coordinate debris removal and disposal. Their fleet include a 56-foot mechanized landing craft equipped with a 3-ton crane for towing and lifting large objects, and a 28-foot aluminum landing craft with a very shallow draft for getting close to the shoreline and additional towing. Clean The Bay is working in the Southeastern Connecticut area through the end of June. Be sure to keep an eye out for one of their landing craft, which is operating out of Brewer Yacht Yard Mystic in Mystic, CT. Clean The Bay relies on the help and support of the local community. If you or your business would like to make a donation, or are interested in joining Clean The Bay’s team of volunteers, visit Clean The Bay online at cleanthebay.us or call 401-835-6388.